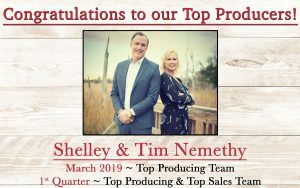 The Top Producing team for March and the Top Producing and Sales team for the quarter is Tim and Shelley Nemethy. 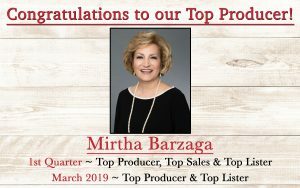 A great husband/wife team who sold $3.3 Million for the 1st quarter. 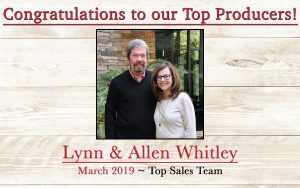 The Top Sales team for March is another wonderful husband/wife team Lynn and Allen Whitley. We have lots of family working at Davidson Realty. Lynn and Allen sold $2.2 Million in March. 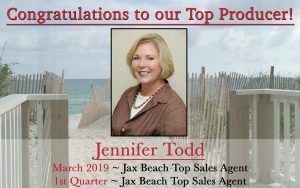 Our Jacksonville Beach office is rocking with Jennifer Todd as our Top Sales agent for the month and 1st quarter. Jennifer’s experience with new construction and the entire northeast Florida area make her a valuable resource for her customers. 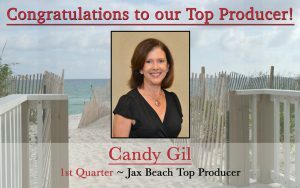 Candy Gil is our Top Producer at the beach office for the 1st quarter with $1.8 Million in closings. Candy receives many great reviews from her customers who turn into treasured friends. 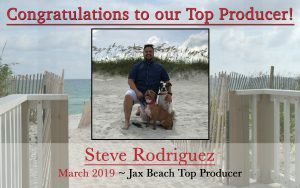 Last but not least, Steve Rodriguez is our Top Producer for the Jacksonville Beach office for March. Steve gives back to many pet friendly causes and loves his dogs. Look for him on the beach making sure the dogs have fresh water. 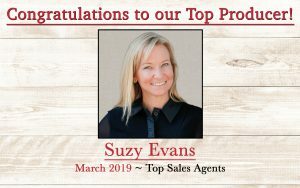 Congratulations to our tops and our entire team!